Everything Changes – The Guide to Young Adult Cancer » Parenting With Cancer: How to Empower Your Kids? Parenting With Cancer: How to Empower Your Kids? I remember when I was twelve my grandpa was dying of lung cancer and I couldn’t even speak as I sat in his hospital room. The grown-ups kicked me out before I was able to say good-bye. When I was diagnosed with Hodgkin’s my kids were four and five. I didn’t want them to feel powerless like I did with my grandpa, but I didn’t know how to help them because having cancer made me feel so powerless. And then I remembered a time before cancer that I was lying on the couch with a pretty bad cold and they made me soup. What they actually made was cold water, lettuce, carrots, turkey, crackers, and bread in a bowl along with a huge mess in the kitchen, but to them it was soup and their faces beamed with the pride of knowing their soup would help me feel better. I started remembering other similar instances of their efforts to help me like bringing me little teacups of water, washing the mirror on the bathroom door with soap, and spending hours scrubbing the fireplace doors with sponges. I thought that maybe with a little direction, there could be something to this. I let them help whenever they offered without worrying about the mess they might leave behind. When I was too tired or in pain I would ask them for water, my pill bottles, a snack, or anything else I knew they were capable of. I even let them wash my hair after my lymph node biopsy when I couldn’t lift my arm. These were not just chores, they were lessons in kindness and with each task I could see that I was giving them some power over the situation and that they took pride in every little thing they could do to help. It’s hard to parent with cancer, but it’s easy to give your kids a little power and in doing so, you may feel a little less powerless yourself. How old are your kids? 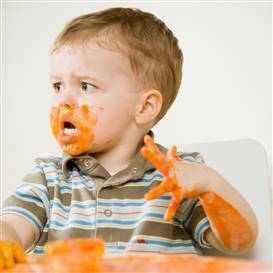 Have they been behaving differently since your diagnosis? Have they ever offered to help you out? How did it go? 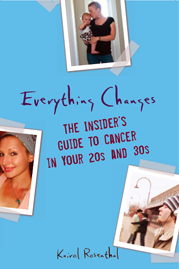 Read more about young adults parenting with cancer in the book Everything Changes: The Insider’s Guide to Cancer in Your 20s and 30s. My kids are 13, 10, and 10 (Boy and B/G twins). This was my second diagnosis but the first was so long ago and the treatment so uneventful, it didn’t register with them. On kids helping, as I wrote in my book, Making a “Welcome Home” sign or a “Congratulations” banner were things they could own and control with my illness. That’s so important to help them feel that not everything is out of their control. Even putting them in charge of watching and refilling Daddy’s water glass serves the same purpose. Those are great suggestions Myles. I also have twins (both girls) – they’re now six and my oldest is soon to be eight. When I was hospitalized they were in charge of decorating my hospital room. They made tons of butterflies and came in and hung them all over the walls. I love how doing such little things can make them feel so big. I was 26 when I was diagnosed with stage 4 Non-Hodgkins Lymphoma, my only baby was 3months old at the time. I was unable yo care for him like I wanted. I had help from my mom and spouse. I am glad he was that young because he didn’t know what was going on. He spent countless hours at the hospitals with me. He gave me what I needed to fight, along with God! He was 1 when I had my allogenic stem cell transplant and he had some issues with that since I was hospitalized for almost six weeks bur overall he has coped well considering his babyhood/childhood has been far from normal. We were in a bubble for years! Thank you for starting this very important conversation about parenting and cancer. My daughter was 9 months when I was diagnosed with breast cancer. At that time, I was breastfeeding her, and I had to wean her off my milk in just a couple of days in preparation for my double mastectomy. As you would expect, that was rough. I think that she was able to really see me and be present for me at that time, which is something that many adults could not do. She never looked away. I do not wish my daughter pain, and I am glad that her memories of that time will remain somewhat fuzzy; still, I wouldn’t change it. We are profoundly connected.